Madrassa teaches children to hate U.S.
CNN's Stan Grant visits a madrassa, an Islamic school, in Kabul, Afghanistan, where children learn to hate America. An Afghan journalist suffered first-degree burns in an acid attack in the capital earlier this week, a report said. Razaq Mamoon is a writer and television presenter, according to Reporters Without Borders, a media rights organization. 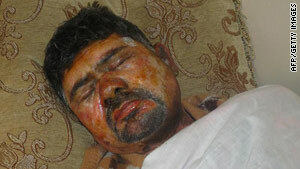 Mamoon was attacked with acid Tuesday night as he left home, the group said. He is hospitalized with nonlife-threatening injuries. A suspect, identified only as Rafiullah, has been arrested, the Interior Ministry said Friday. Reporters Without Borders is urging the Afghan government to fully investigate the attack. "We have already identified a dozen or so cases of violence against Afghan journalists for 2011," the group said. "The authors and originators of this barbarous act must be swiftly identified and arrested." Acid attacks on journalists are not common in the country, according to NIA, an Afghan organization that protects journalists. A government official in eastern Afghanistan was killed in an IED attack Friday, officials said. NATO's International Security Assistance said the district governor of Dur Baba in Nangarhar province was among the three people killed when their vehicle struck an improvised explosive device. The official is Khorshad Khan Khogianiwal.